It’s not often when I travel that I get to eat at the same restaurant more than once on the same trip. 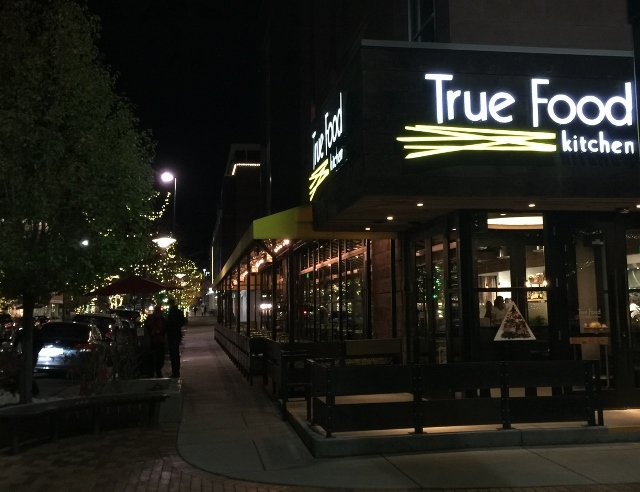 But somehow on a recent trip to Denver I was lucky enough to eat at True Food Kitchen in Denver twice. I shared one dinner with a friend and then had a late lunch by myself a few days later. Both meals were excellent. I’m excited to share them with you! 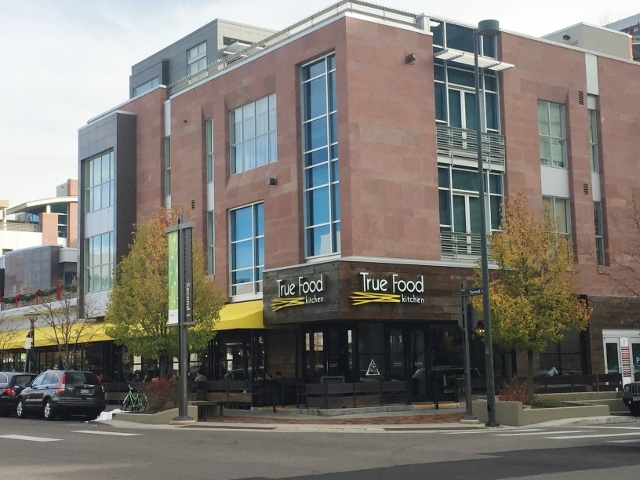 True Food Kitchen was founded by Dr. Andrew Weil. 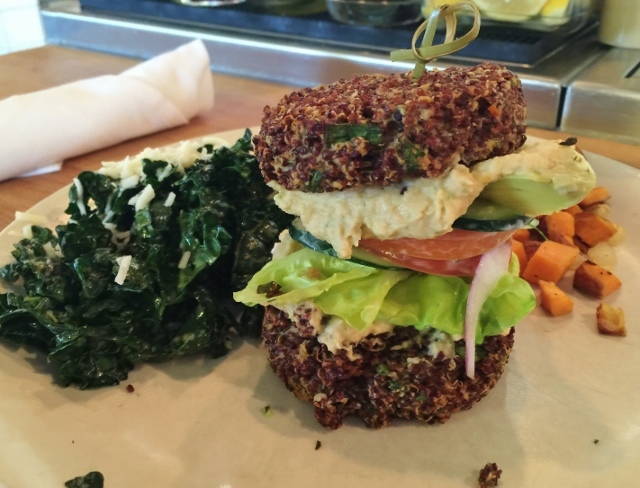 All of the menu items are based on his anti-inflammatory diet and feature as much local, organic produce as possible. I was impressed with how easy it was to navigate the menu, with items clearly labeled gluten-free, vegetarian and vegan. The difficult part was deciding which of the many options to sample! 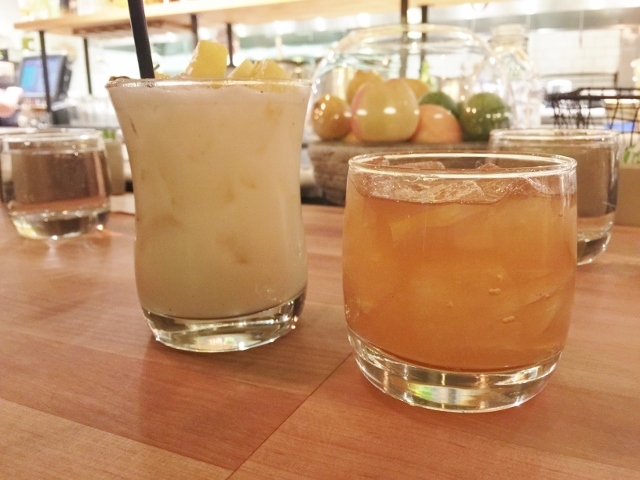 We started with cocktails, prepared fresh right before our eyes at the bar seats. I was captivated by all of the house -infused organic spirits and wide variety of fresh embellishments on each cocktail that was created. Sitting at the bar was a treat, as we could see not only cocktails being made but also food prepped and prepared in the open kitchen. 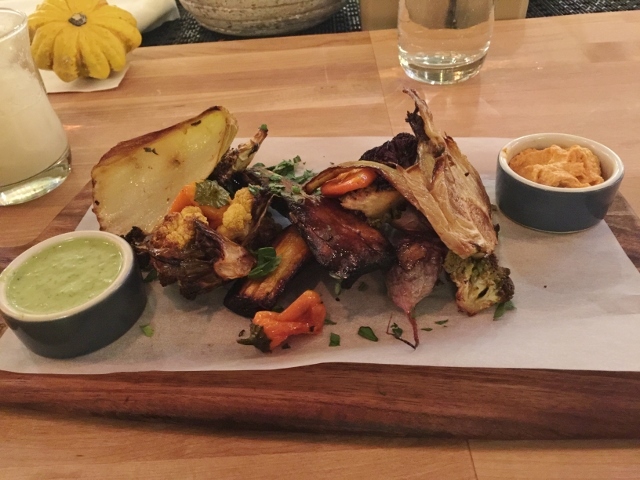 On the first trip, I shared the roasted vegetable platter which is seasonal. It was accompanied by two dipping sauces, one a hearty hummus and the other more like a dressing. This would have been an exceptional meal for one by itself! 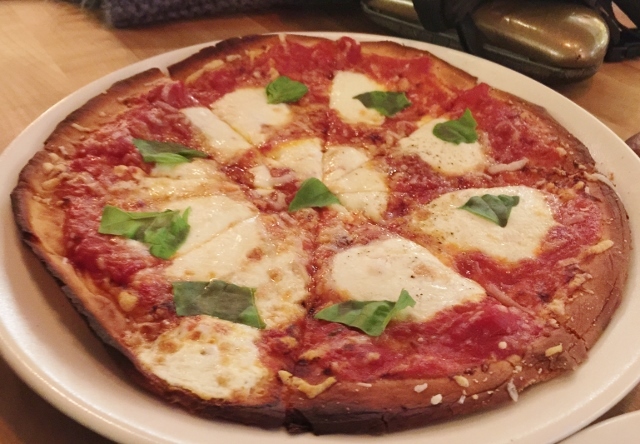 My dinner companion had a gluten-free margherita pizza which was beautiful! I enjoyed a little sliver of it and really liked the thin crust, lightly charred on the edge. I really appreciated our server making a note and letting the kitchen know this pizza was ordered by a guest who needs to be gluten-free, not a fad dieter, so they could take proper precautions when preparing and baking it. On both of my visits to True Food Kitchen, I had the same entree. Unheard of for me, especially when there is more than one option I can safely eat. Even more unheard of is for me to order a dish with quinoa even once. I’m not quinoa’s biggest fan but this inside-out burger could change that! Two “buns” of quinoa with hummus, tzatziki, red onion, feta, cucumber, tomato and avocado nestled between. A definite knife-and-fork burger. I enjoyed the sides of kale and sweet potatoes almost as much as the burger! As I mentioned before, the bar is open to the kitchen. When I dined along for lunch, I noticed a staff member prep at least 10 squash for the evening’s dinner service. Great commitment for fresh, organic produce, including local when available. 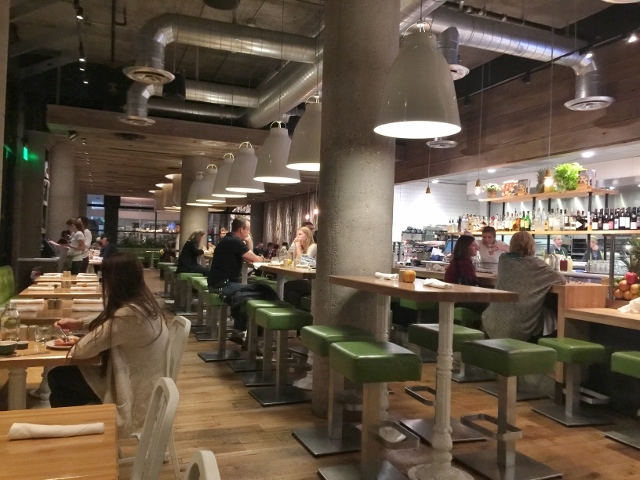 True Food Kitchen is high on my list to visit the next time I am in Denver or any of the many cities who now have locations of their own, including Atlanta, Dallas, San Diego and so many more. I’m especially excited to see they are opening in Nashville and Chicago, two cities I visit often. Denver, Colorado 80206. 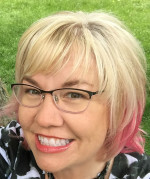 720.509.7661. I parked at metered parking streetside on both visits. That was such a terrific visit we had there! If I had a local True Food Kitchen, I’d be there all the time, and I’d probably eat that roasted veggie platter, over and over. Man, that was good! I am pretty sure that it would be my top choice over the margarita pizza and that’s saying a lot. That quinoa inside-out burger is worthy of lots of re-invention with all kinds of fillings. So creative and obviously so good since you enjoyed it twice! It’s really exciting that more True Food Kitchens are opening. 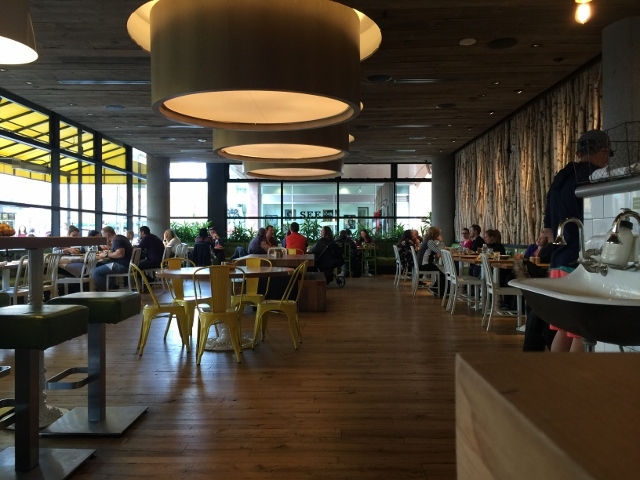 I loved dining in the one in Santa Monica just as much as I enjoyed the Denver location. They are bright happy spots and the food definitely tastes “true” and wonderful. There’s a location in Northern Virginia, but I’m more likely to visit a True Food Kitchen somewhere else than there. Thanks for sharing, so I could re-live our visit to the Denver location! That truly was a great meal with wonderful company! It makes me happy to see more real food restaurants opening.